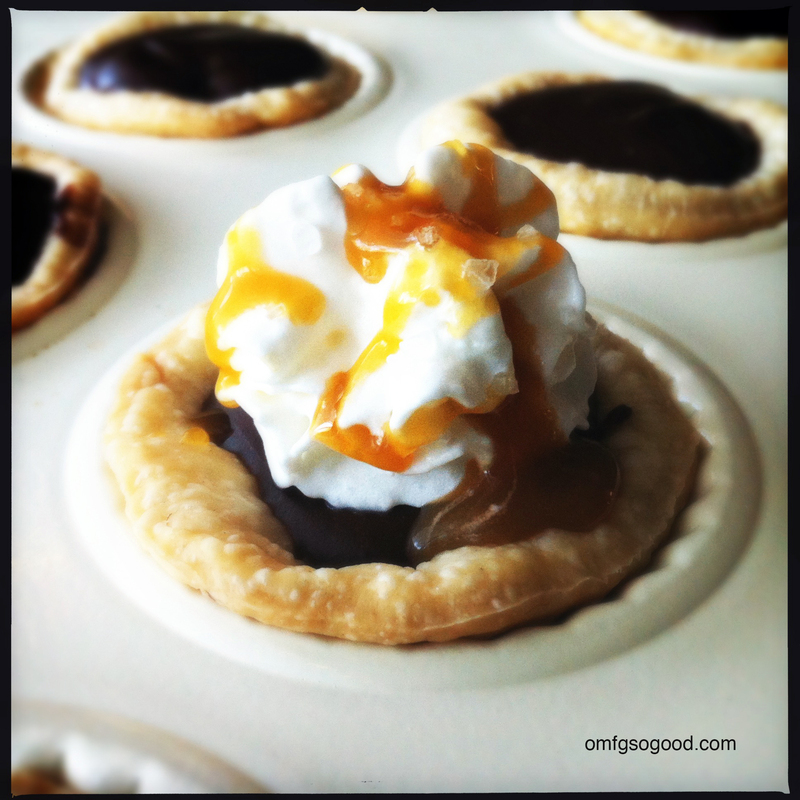 mini salted caramel mocha tarts | omfg. so good. They’re like a delicious seasonal beverage from Starbuck’s. Only smaller, better and probably cheaper. I’ll admit, I frequent Starbuck’s. A lot. Probably way more than I should. I usually just order a grande soy latte out of sheer laziness. And because deep down I know that what I really want to order would wipe out my recommended calorie consumption for the entire day. The Salted Caramel Mocha. Holy poop, those things are good. Today I managed to take that flavor combination and shrink it down to a bite-sized, semi-guilt free, pie. Or, what the distinguished refer to as, a ‘tartelette’. Funny, when I hear that word I immediately think of a tiny little street walker. Distinguished? That, I am not. Preheat oven to 350 degrees. 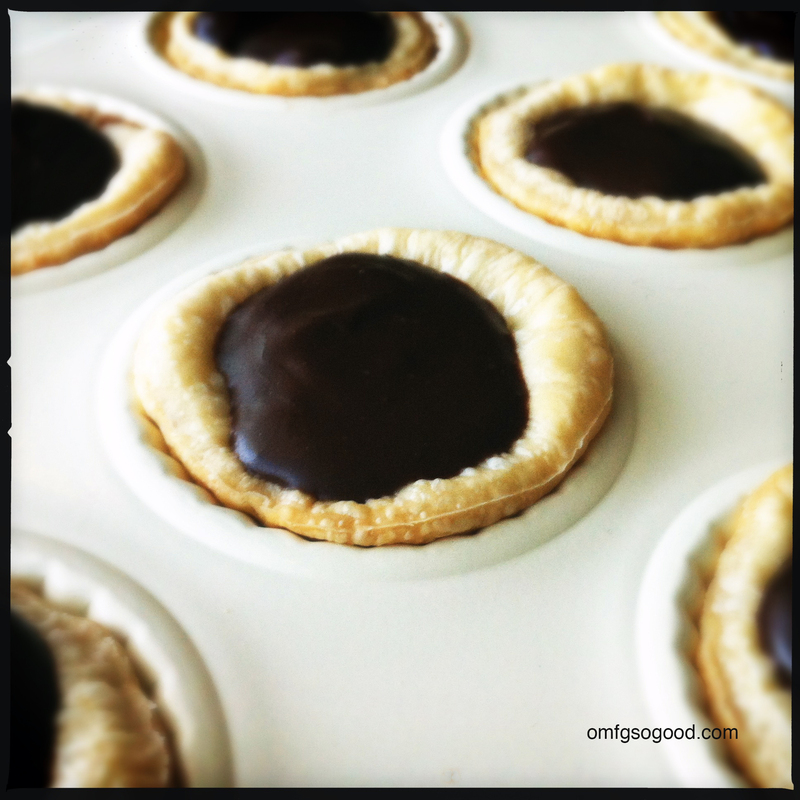 Using a 3″ round cookie cutter (or a drinking glass) cut 12 circles from the pie crust. Place one circle in each tart pan cavity and gently press to form, then poke with a fork to allow for steam to release during baking. Bake in the preheated oven for 10 – 12 minutes or until light golden brown. Remove from oven and cool completely in the pan on a wire rack. To make the mocha pudding, combine the cornstarch and 1 cup of the milk in a small bowl and whisk until smooth. In a medium saucepan, combine the remaining 2 cups of milk and the cream and bring to a very soft boil over medium heat. In a small bowl, dissolve the espresso powder in the hot water then add that and the chocolate chips to the milk/cream mixture, reduce the heat to medium low. Stir to melt the chocolate completely then slowly add in the cornstarch/milk mixture, stirring constantly. Continue stirring over medium low heat until smooth and thickened. This could take up to 8 minutes. 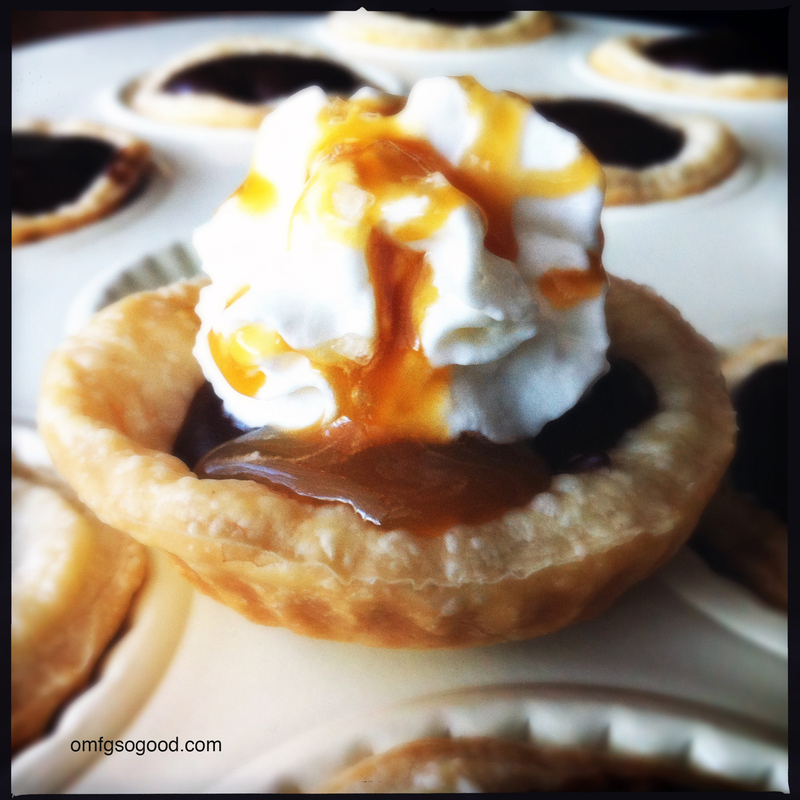 Remove from heat and carefully spoon into the prebaked tart shells. While these tiny little street walkers are chilling in the fridge, make the salted caramel sauce. In a heavy saucepan, melt the sugar over medium heat until it darkens to a light amber color. (This will happen QUICKLY so don’t leave the stove. Unless you have a toddler pulling on your leg because he pooped in his pants. Then it’s okay, you’ll just have to start over. Trust me, I know this.) Add the butter and stir until melted and combined, then remove from the heat and SLOWLY add the cream and whisk to combine then whisk in the salt. Remove the tartelettes from the refrigerator, top with whipped cream and drizzle with salted caramel sauce then top off with a few sprinkles of fleur de sel (or coarse sea salt). Zoinkies, are these good. As a matter of fact, I think I need to go eat another one right now. Okay, maybe two… or three.